Now, this is a fun do ahead mixture for the best Spicy Bloody Mary. We always have an extra “pickle jar” of this bloody mary infusion mix in the freezer ready for those special occasions when we have a fun brunch or when the craving hits. 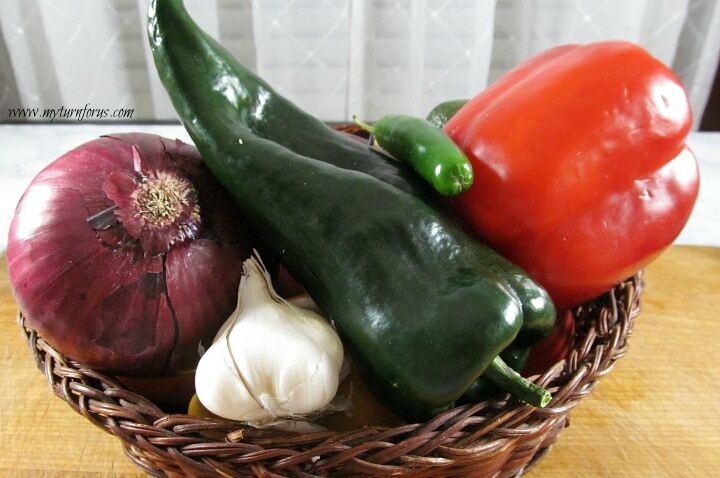 It takes a basket of peppers, onions and other veggies, a hot grill and a little bit of time. This drink brings such sweet memories of our eldest daughter’s wedding. She chose to be married on the bank of “The River”, (that’s what my son-in-law calls it “The River”) this is where they go each year with numerous other friends and their families to have fun with their boats and other river craft. They set up huge tent picnic areas and just enjoyed great company and water fun. My daughter and her sweet hubby chose to be married at their annual outing when all their friends would be in attendance and then have fun in the sun. Yes, I did wear a bathing suit to my daughter’s wedding! They were married early in the morning on the bank of the river and we made Bloody Mary’s to serve the guests and toast the new couple. This is now known as the drink of “The River” and we are the parents that brought pickle jars of liquor to the wedding! What fun!! Oh yes, we are total CLASS! So grab some peppers and onions and let’s get this infusion going! 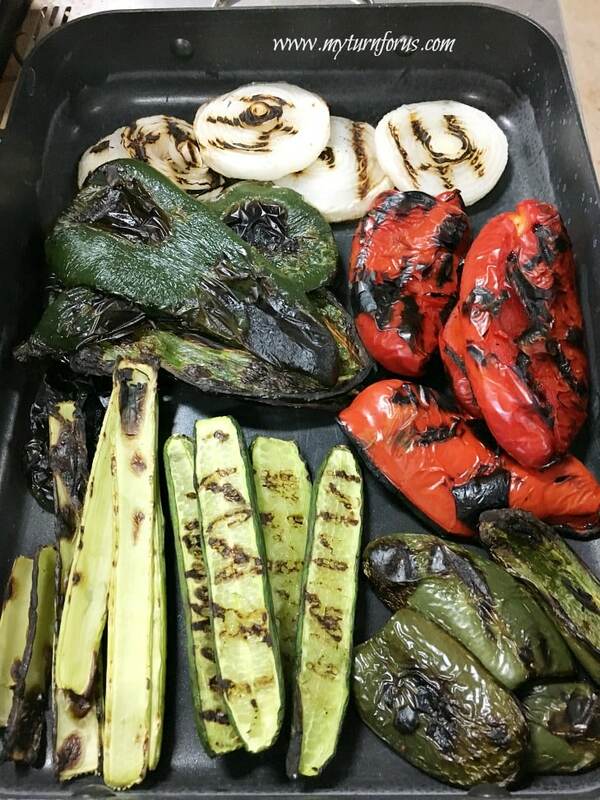 Sliced vegetables and peppers grilled and charred and are smelling amazing. 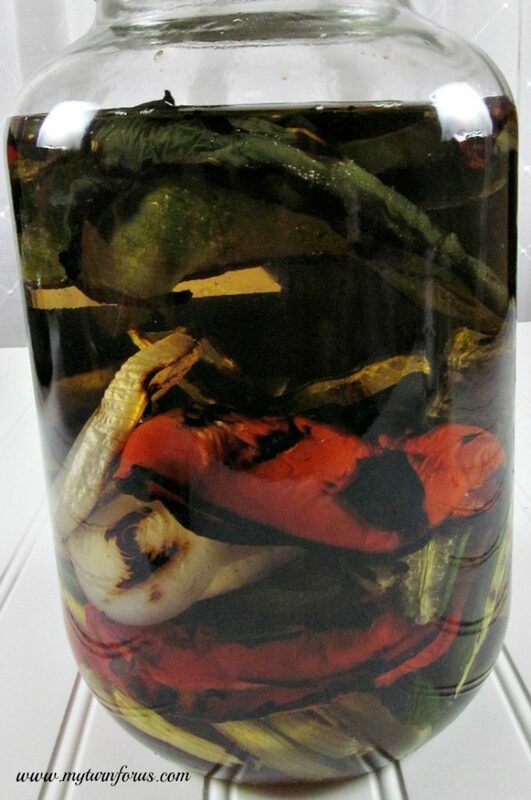 All those charred veggies swimming in vodka awaiting their time to make our favorite Bloody Mary. 2. Grill until chiles and peppers are blackened and onion and cucumber are browned, remove from grill. 3. Place peppers and chiles in a paper bag and twist to close. Allow to steam until cool. 5. Place all the grilled veggies in the jar along with the garlic, chipotle chiles, garlic, and celery. 7. Place in fridge for at least a week but up to a month. 8. If not used within a month, remove the veggies and freeze the liquid. 1. Fill a glass with ice, add a shot or two of the infused vodka and fill with tomato juice or v-8. 3. Garnish with celery and olives, optional. Salivating over your bloody mary! YUM! Now that looks like our type of bloody Mary! Got some kick to it! Love it Evelyn! I've never had a Bloody Mary, or any alcoholic drink really… Even a few sips and I feel totally drunk so I don't really drink lol! 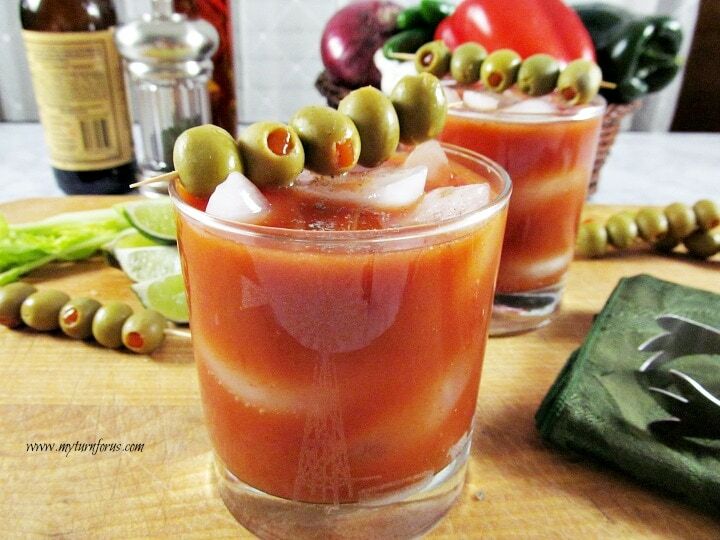 I don't have a Bloody Mary recipe so this is perfect! Yum!!! 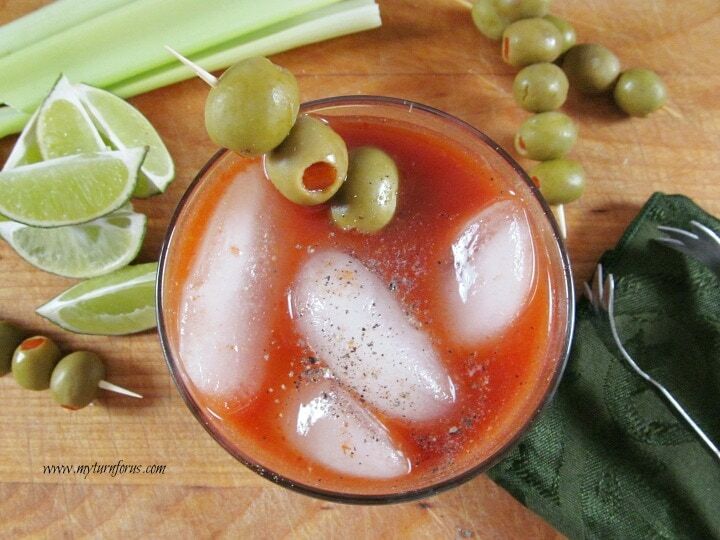 And have you ever noticed, you really can't drink a bloody mary if it doesn't have a stalk of celery in it for stirring! I love the idea of getting married outdoors or anywhere else that fits the couple! The location really doesn't matter — I hope they will have many happy years! Thanks for sharing such beautiful memories, nature is the most beautiful place of all! Looks great! Thanks for sharing at the All Star Block Party. Yummy!! And that certainly sounds like a fabulous wedding! My husband would love this. He loves bloody mary's. I have a link party on Wednesdays, and I would love it if you would link this post. It is called Wednesdays Adorned From Above Link Party. Ooh yum, this sounds GREAT! Thanks for sharing at The Fun In Functional! I MUST try this!!!!! YUM!!!!!! 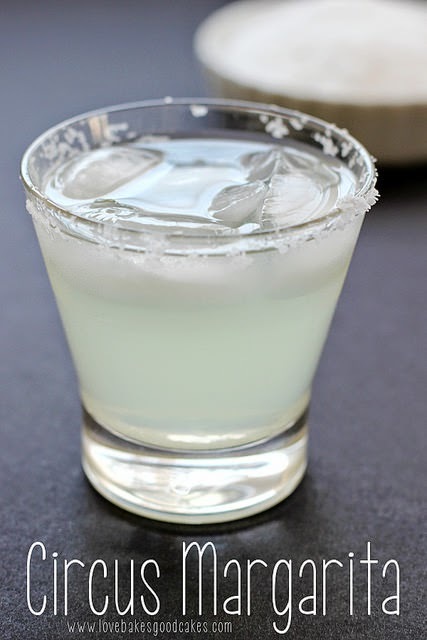 Okay, I don't drink, but looking at this drink makes me think I can do this without the liquor! Looks really good! Thanks for sharing on Foodie Friends Friday! Don't forget to come back and vote on Sunday! Thanks so much for sharing at Heavenly Treats Sunday! This looks so refreshing! Sounds like the best wedding ever! and those look delicious! Thanks for linking up to my NO RULES Weekend Blog Party! 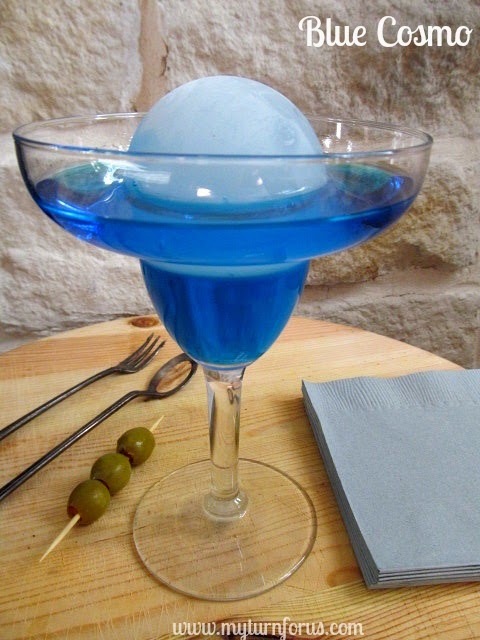 I'm always up for a cocktail recipe. 😀 Thanks for sharing. I featured you this week on Motivated Monday at BeColorful. 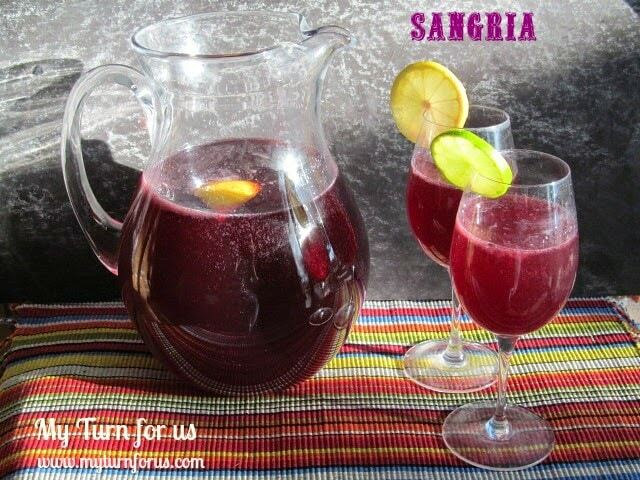 This looks wonderful (as in, I wish I had a glass right now! ), and the wedding sounds like it was wonderful too. Thanks for linking up at Sweet Saturday !! This looks so refreshing. Thanks for stopping by, Show Me What You Got Tuesday's at ODH. Looks yummy! Thank you for sharing at The "Sunday Stop". Did you know that your link "The Best Parties on the Block" says that there is no such page? Thought you should know that your link is not working. If I like tomato juice – this is definitely something I would try. 🙂 Thanks so much for sharing on Tout It Tuesday. Hope to see you tomorrow. Thanks for sharing at Show Off Friday! I hope you have a fantastic week! What a wedding and what a bloody mary! Feel free to drop by and class up my parties with pickle jars of this anytime. ANYtime! The wedding sounds wonderful. I don't drink alcohol, but must admit, looks super refreshing. The grilled veggies look yum. Thanks for sharing with Share Your Cup. Your daughters wedding sounds lovely, byo alcohol bottles sounds even better to me! You had me at bloody mary! Thanks for bringing this to the Oldie's party! Hope to see you back there next week. Hey! I just popped over from Do Small Things with Love's Happy Hour Friday! 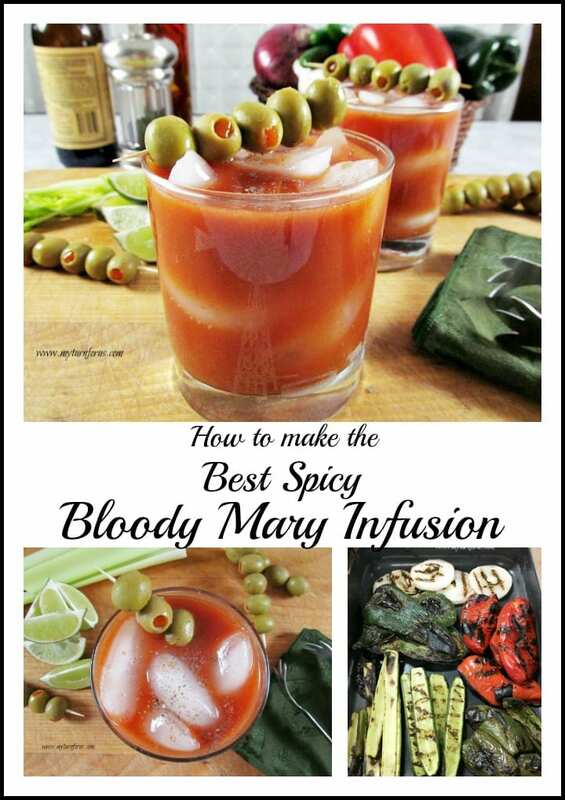 Your Bloody Mary Infusion Mix looks AWESOME!!! I WILL be doing this this weekend! Thanks for posting!